The Label Rouge turbot has exceptional qualities. It is a noble fish with delicate flavors. An undeniable proof of taste quality, the Label Rouge guarantees strict compliance with demanding specifications. This rigour applies to the diet based on marine products (at least 60%), plant products, vitamins and minerals. A requirement that also imposes tests and controls both in production and processing. The quality requirement is at this price. • Calibrated whole turbot - evisceration on request. • Taste qualities guaranteed by the respect of the Label Rouge specifications and validated by sensory and taste tests carried out by a certified laboratory. • Nutritional qualities: low in fat (less than 1g / 100g), rich in good quality protein, potassium, phosphorus, B vitamins and Omega3. 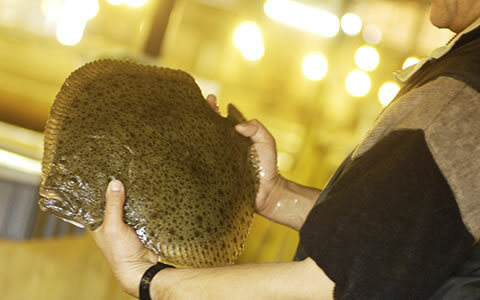 Process : When ordered, turbots are fished in breeding ponds and sorted manually to form homogeneous batches. The method used for slaughtering is to bleed the turbot to ensure the whiteness of the fillets, and then cool quickly in ice water to preserve the organoleptic qualities of the flesh. 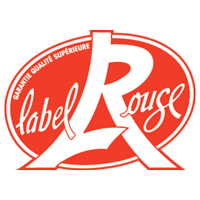 The Turbot Label Rouge is subject to very strict controls on the cold chain, on the SLD and on the quality of the products (grammage, trace of blood). Traceability is ensured at all stages of production. 1 • IN WATER, BY CONTAINER: This type of packaging allows deliveries to A for C to most major European cities. 2 • WITHOUT WATER: Watertight box : The fish are placed individually in specific watertight boxes, hermetically closed. This type of packaging concerns all shipments for which T.E.T. (Total Emersion Time) does not exceed 24H. Airplane Parcel: After fishing, the turbots are placed individually in specific trays, which are then integrated into a grouping package. Shipment by CONTAINERS and WATERTIGHT BOXES: via our network of carriers Marée, under controlled cooling. Shipping by COLIS AVION: via specific transport providers referenced by France Turbot Ichtus, under controlled cooling. Gloria Maris Groupe, exceptional aquaculture and leader in France for almost 30 years with 4 high marine species: sea bass, sea bream, salmon sea Label Rouge and turbot Label Rouge.